News: Is Your State Addicted to Tobacco Taxes? 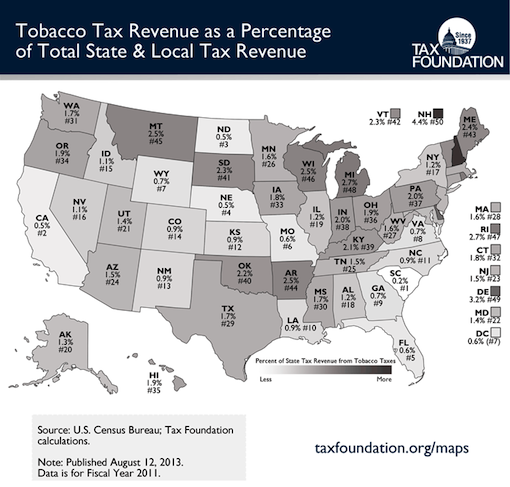 The non-partisan Tax Foundation has produced an interesting graphic showing what percentage of each states’ revenues comes from tobacco taxes. The data indicates higher tax rates don’t correlate to higher revenues for a particular state. New Hampshire, with one of the lower tobacco tax rates, leads the country with 4.37% of state revenues being collected from tobacco taxes. New Hampshire has lower taxes than any of its regional neighbors: Maine, Vermont, Massachusetts, and Connecticut. Meanwhile, none of the top 10 states for cigarette taxes (New York, Rhode Island, Hawaii, Washington, Connecticut, New Jersey, Wisconsin, Massachusetts, Vermont, and Arizona) are in the top 16 states when it comes to percentage of revenues produced by tobacco taxes. Not surprisingly for those who follow these things, New Hampshire, with it’s low tax rates, has the lowest rate of cigarette smuggling in the country. New York, with the highest tax in the country, has the most cigarette smuggling. Cigarettes are more of a pure commodity than cigars, but it’s worth noting higher taxes don’t necessarily mean higher revenues; they do mean more smuggling. These are important facts to raise if your state or locality is proposing to raise tobacco taxes (and cigarette tax rates are highly correlated to cigar tax rates). The data also begs the question: If higher tobacco taxes don’t actually raise more revenues for the state, why raise tax rates? One possible answer is that politicians are trying to use taxes to control the actions of their citizens and make it unaffordable for adults to choose to smoke (though the data also suggests they are driving citizens to buy smuggled tobacco). More fundamentally, the fact that tobacco taxes make up such a major part of so many state budgets should (but probably won’t) give anti-tobacco activists pause. After all, is it really wise for the state to be so dependent on tobacco taxes? I keep expecting the anti-tobacco folks to push for a uniform federal tax, especially on cigarettes, and cite state-to-state smuggling as the reason it's necessary. Frankly, I'm surprised such a move isn't already under way. The US tax code is not set up for such an endeavor, and it would be a major constitutional overhaul to enact it, so I doubt it will happen. States have the right to set their own tax policies. Good point, George. Good reading Patrick S.
Here in Rhode Island the tobacco tax is high because, well, all taxes are high here. I don't think the majority of of state legislators here have ever seen a tax they don't like.
" If higher tobacco taxes don’t actually raise more revenues for the state, why raise tax rates" Higher tobacco taxes do boost revenue, although we are getting to the point where tobacco tax hikes do not often raise the amounts predicted. I don't think anyplace, at least on a statewide level, has raised tobacco taxes and seen revenue fall from pre-hike levels. At least for the first year or two, revenues go way up.